Hey Pandamonium, thanks for the words of wisdom. I plan on using the funds to either buy a PFF69/70 whenever they are more readily available. Perhaps someone doesn't mind owning this one for such a low price. Heck, I'll even sell it for 139.00, and box and COA included. 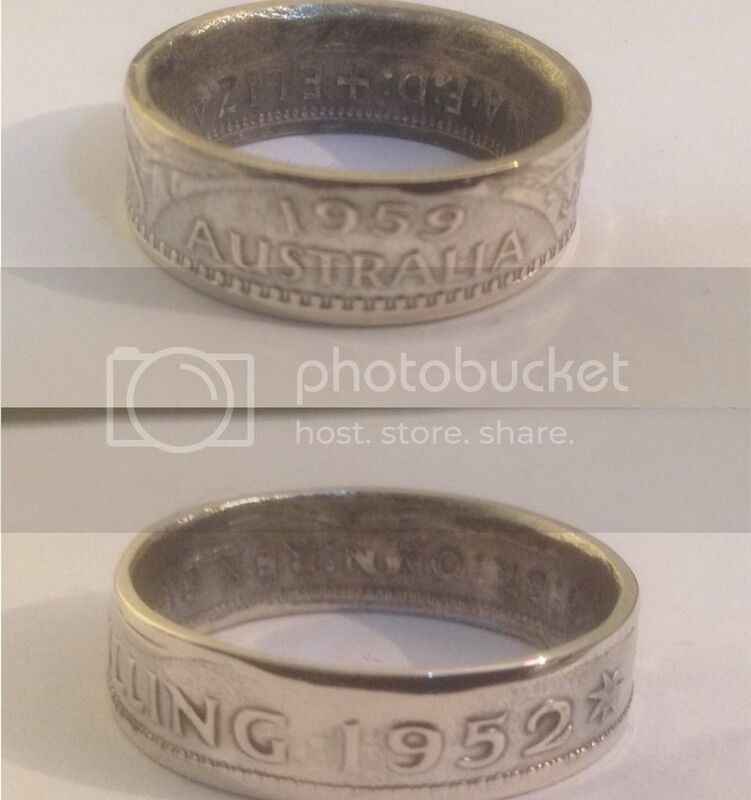 Over in silver stackers there is a guy who takes coins and makes rings with them. Pretty fascinating. Keeps the details of the coin intact, but shapes it into a rign to wear. If I don't sell it, I may make a ring from it. That 1985 Brass coin is an ample illustration of the adventures you get into with MCC; very exciting history, and nothing to be taken for granted. Presents given away for free to dignitaries suddenly morph into mega bucks! Just keep us informed on what happens to your "shoddy" medal. It will be good to know. The high altitude flight in the cold up there may have had the refrigerator white spot induction effect on the medal! Another depiction of the "situation" you mentioned could be that someone claims to have transferred coin preservation technology to a coin trader who cannot refute that openly and has more tact than me and you (me especially) than to come out in the open about the feasibility of such an "arrangement". However, I am sure he is astute enough not to be pushed into any crazy scheme that is littered with minefields. Even NCS cannot make such claims. Otherwise he should set aside a few millions for the invariable lawsuits! But what can a guy (or guys for that matter) do when the "big boy" of the only medium that talks about their products breathes down their necks while foisting such schemes on them. Their first instinct probably will be to lie low for now and say nothing. Otherwise thunder will erupt or they could be shamed! I prefer not to write more on this; I gotta "behave" or my Karma could be shaved off again! I am begining to like those Karmas! Normally they should reflect on your productivity in this medium. Hey KOT, if this was a one off, I wouldn't be too concerned. I'm skeptical that it's just mine with issues. Look closely (blow up pictures) on listings found on the Internet. Look at the proof section. That's all I'm going to say, because I don't want to be accused of being ultra critical about this medal. I already have neutral karma. Because as most can attest, I really do love this series! And spent thousands (money where my mouth is) on it. I have most in the series...and for some (old summer Palace) a couple. The art work is stellar. Period. End of story. As you too can attest. Yes. It is a good idea to let the issue rest for now. In scientific terms whatever information that seems to be out there right this minute is mainly anecdotal given that this medal was just released recently. It will take a few months, at least, for the grading organizations to accumulate enough data to give preliminary impressions of the quality profile of these medals. Even at that the grading statistics is not likely to be different from the profile we already have for prior series. NBM posted data for previous classical garden medals. Optimistically, the Mountain Resort medals, for example, may grade better than YMY but not as well as the Lan Ting medal. I really wish that at the end of this series a PhD student will write his/her thesis on the Classical Garden medal series either from the perspective of art appreciation, art history, metallurgy or even minting technology. There are several directions you can approach such a research thesis from. The student can even spend some time with NGC and PCGS and be taken through high magnification studies of the medals. These medals are being produced with innovative technology which for now focuses more on imprinting sculpture-like multidimensional multi-faceted images on metal with plain vanilla coin stamping action. Some medals are stamped several times to produce the final image (ala the Mammoth medal). In these circumstances aiming for perfection (MS/PF 70) is not the initial aim. I believe the aim is to transfer a composite or artists' impression of key elements of the Gardens unto the medals. It is not envisaged that the Shanghai Mint has suddenly lost their expertise in wholesome coin/medal production. Coin and medal grading was introduced to achieve different objectives. One of them is to provide a universal nomenclature that every coin collector understands no matter where you are. So a coin classified as PF 65 will be understood to be what it is and a PF 70 coin is, well, a PF70! This allows you to perform coin transactions from a distance without worry. Coin grading does not mean that every coin should be perfect. Beauty is in the eye of the beholder and not everyone pays the same attention to the grade. In fact NGC/PCGS data shows that in many coin series less than 50% of the coins reach them for grading. We have even heard in various coin forums where members say they don't grade all their coins or medals. Many prefer them in their OMP. If coin perfection is desired by all, 3-D printers can probably produce such in a consistent manner. In that case our medals will be soulless works of art on cold metal, every line straight and similar to the opposite side's. I prefer them to remain works produced by living beings like me and you, with all the blemishes that come from such endeavor. Thus various portions of the medal will reflect the artist's state of mind, health, concentration, mood, optimism, sadness, energy, lassitude, enthusiasm, doubt, inattention, distraction and all the thousands of factors to impact on the artist's and production team's functioning. Let's give this medal time to land! Well said, KeepOnTrying! We should not lose sight of the experimental nature of this series. 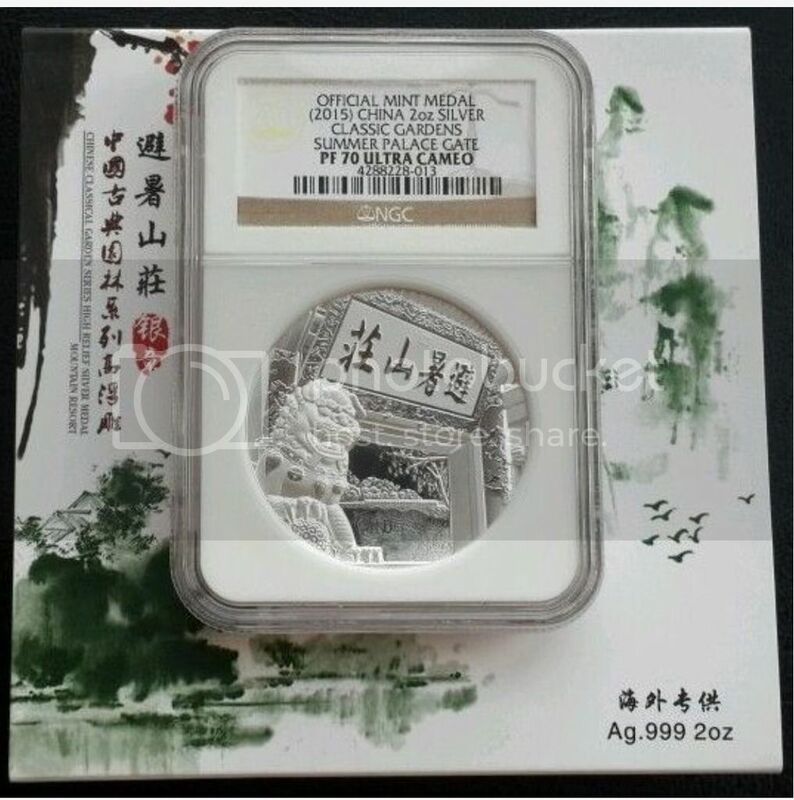 Two oz high relief coins/medals were not frequent from China mints. Yuyuan was first made in anticipation of the 2 oz Dunhuang silver coin, as a trial project. In a sense, Lan Ting was the most banal in terms of technological innovation. That's why it received so many high grades. Later medals which made use of the deep dish or high relief designs or manual polishing were clearly imperfect in grading terms, like the bright spots in sandblasted areas, or the hairlines on antique finish Mountain Resort. But then the design and engraving well compensate for such imperfections. Hopefully collectors will value their artistic, historical and cultural aspects more than their conditions. Good stuff KOT! Very nice. And I completely agree. I'd much prefer humans making my medal vs a 3D from start to finish. Although if someone pays a pretty penny for a product, I think most, 99.9% would expect it to come in a better condition than the one I received. If someone disagrees and you have one of these, want to trade? Nuf said!! Also, I know this to be the case, because of the emails I received. And once again, I never once said it takes away from the artistic appeal of the medal. As a matter of fact, from the outset I've continued to say it is a gorgeous medal. I don't think the quality of my medal has to do with the capsule being opened. It looks to me like it came from the mint this way. Of course I can send it to NGC and get an expert opinion on it. I'm not saying all medals of all series should score a 70. That would be boring. lol. I like it when there are on a few. Makes life for a collector of 70's a bit more exciting and challenging and rewarding - for me anyway. I have looked at the Lan Ting medal from time to time and wondered why it has scored so high on grading. Your explanation makes sense. However, it is still a complex piece of artwork. With all those swirls and swales, and the figures dotting the creek it is as complex as it gets. But yes (sorry I just have to say it) using the restroom on ground is a different proposition from using one during turbulence at 35,000 feet; more balancing skills are required and accuracy still cannot be guaranteed! wow , active active. all of classical garden of thread here for last 2 days. Personally view, Frank is looking at the art viewpoint of quality. Some other look at the physical medal viewpoint of quality. 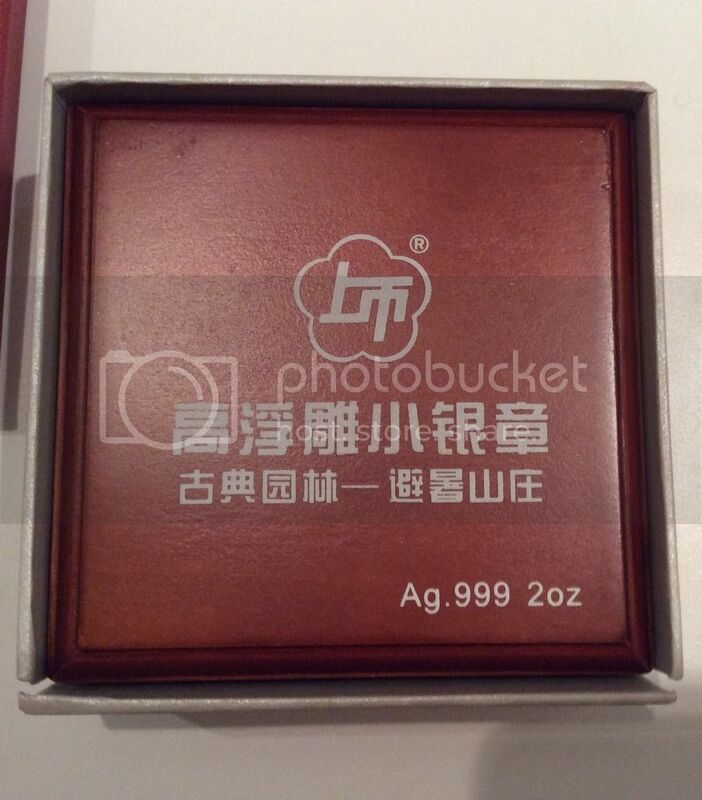 Why shanghai mints choose this series of medal as experiment and not others? I am very curious...... Is that the private investor of this series too rich and would like adventures or ????? Shanghai Mint did not choose this series for experiment. It is the group of private collectors who demanded the different technologies, such as deep dish and high relief. Shanghai Mint just followed along. The process shows that Shanghai Mint was not prepared for the high relief on Yuanmingyuan, and did not foresee the difficulty. They cracked dozens of dies, and thought of pre-forming the blank to reduce the pressure required, which failed because of alignment issues. I guess they would not have accepted this project had they known the difficulty. But now they do have more experience, with fewer dies cracked for the Mountain Resort. Can anyone riddle us westerners this? Why do we get the cookie cutter box and the easterners get the nicer one? It looks nicer at first glance. Can someone post pictures of both boxes so we can compare and contrast. Box and case and COA? Thanks. Western: the one I got and many others got, and from what I've heard, but can't substantiate, we paid more for ours than did the easterners. IF TRUE, why? And why did they get the nicer box. I can say some westerners are very unhappy about this decision. Bob, you got it totally mixed up. The nicer box was custom ordered by the overseas distributor located in Malaysia. I believe he ordered around 200. All the Chinese have the cookie cutter boxes. When and how will the distributors (Malaysia and China) release more of these? Why not standardize? Why make some cookie cutter and others nicer. It is a little perplexing to us. And trust me, I'm not a lone voice on this one, just the one willing to put my neck on the line and have -15 karma points. I'm assuming the private investor made this purchase for his region of the world? Whereas 'our guy' took the cheaper route? If so, why? Why not one standard? I'm only asking what others want to, but are afraid to or don't want to. Thanks. Long stories short. The group decided to keep the cookie cutter style of the boxes to be consistent. There is also a cost issue. 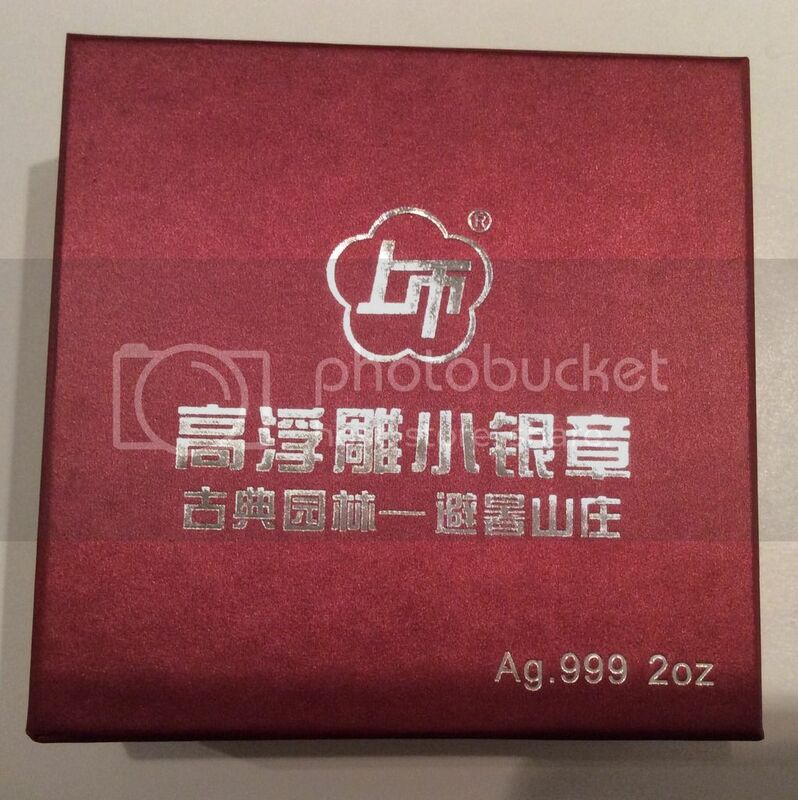 But the overseas distributor insisted on a special box for the mainly Southeast Asian market. Since this is the first time to have an overseas distributor, some room was made for him. Even the Chinese collectors are trying to grab this box.